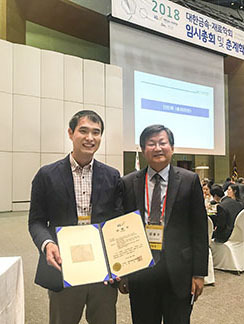 Prof. Chong Soo Lee of Material Reliability Lab (MRL) won the best paper award from Korean Institute of Metals and Materials on April 26th, 2018. 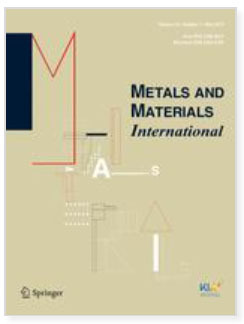 His paper has been selected among 301 papers published in Metals and Materials International (SCI, Impact Factor1.889) during 2016 and 2017, and the award is considered most honorable to the researchers/scientists. The title of article is “Role of Deformation Twin in Static Recrystallization Kinetics of High-Purity Alpha Titanium”, written based on the doctoral dissertation of Dr. Jong Woo Won (2016 Graduate of MRL), You can find the article at https://link.springer.com/article/10.1007/s12540-016-6369-y.